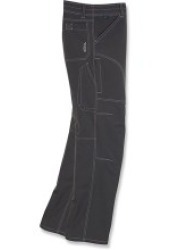 The Kuhl Renegade pants look like cotton work pants, however these pants make great outdoor hiking / trekking pants. The Kuhl Renegade are made for comfort, for starters the knee area is articulated and the crotch area is gusseted which will provide the outdoor enthusiast with lots of mobility without tightness. In terms of pockets to put all your outdoor gadgets, the Renegade pants has lots, seven pockets to be exact. The two upper pockets have mesh backing, so to help breathability. The material is called Tufflex fabric which is roughly 90 percent nylon with 10 percent spandex, this combination provides stretchiness Kuhl Renegade Rugged Outdoor Pantsfor mobility as well as quick drying properties and wicks away moisture from the skin when you sweat a lot.